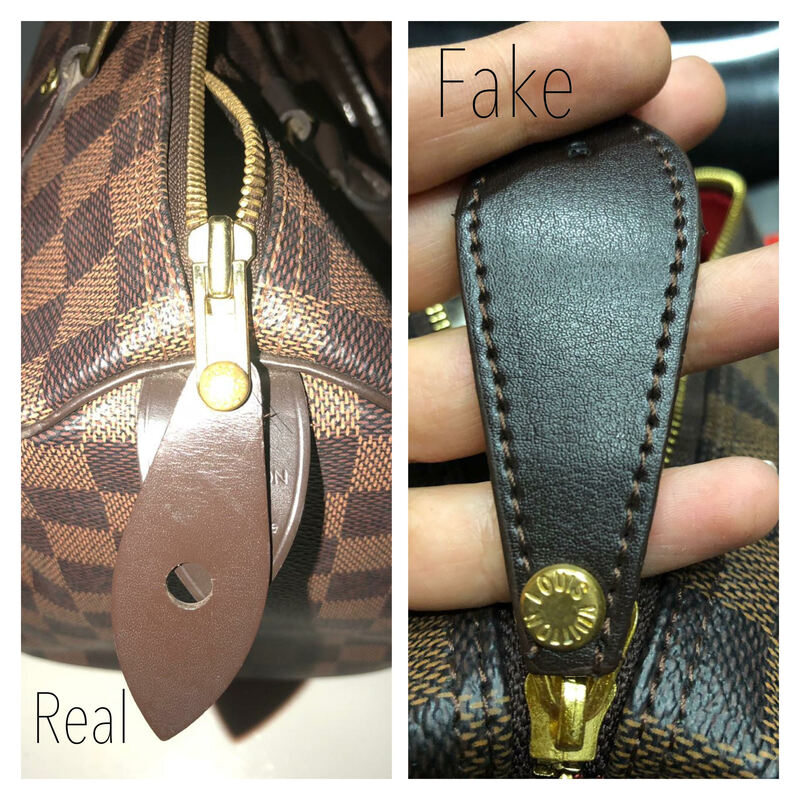 Today I will try to help you to make the difference between a real and a fake Louis Vuitton Speedy bag. 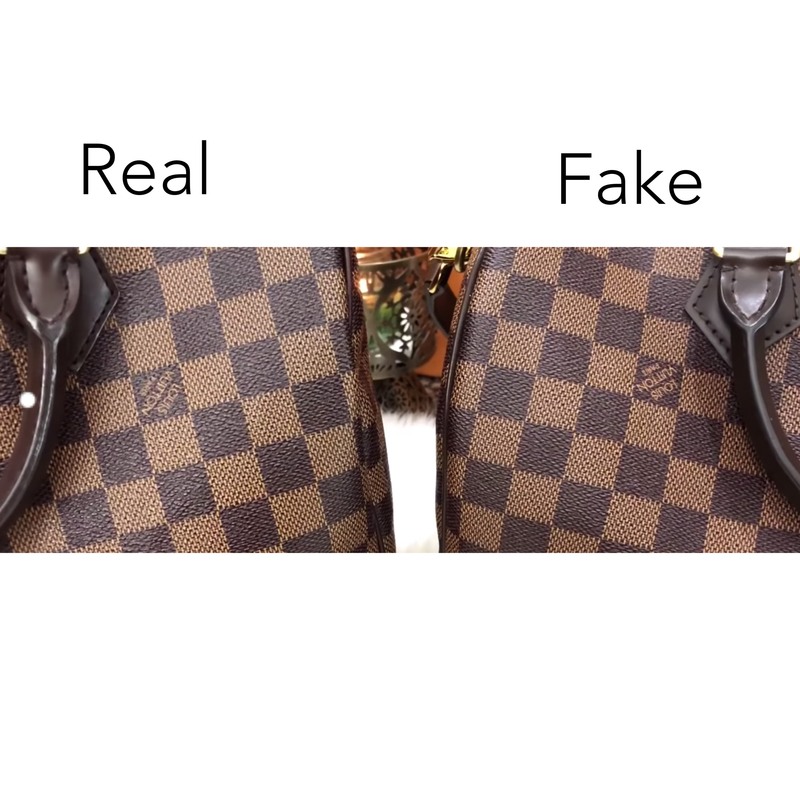 I have written other articles about spotting the fake and I’m pretty sure that a lot of you can easily find if a LV bag is authentic or not. 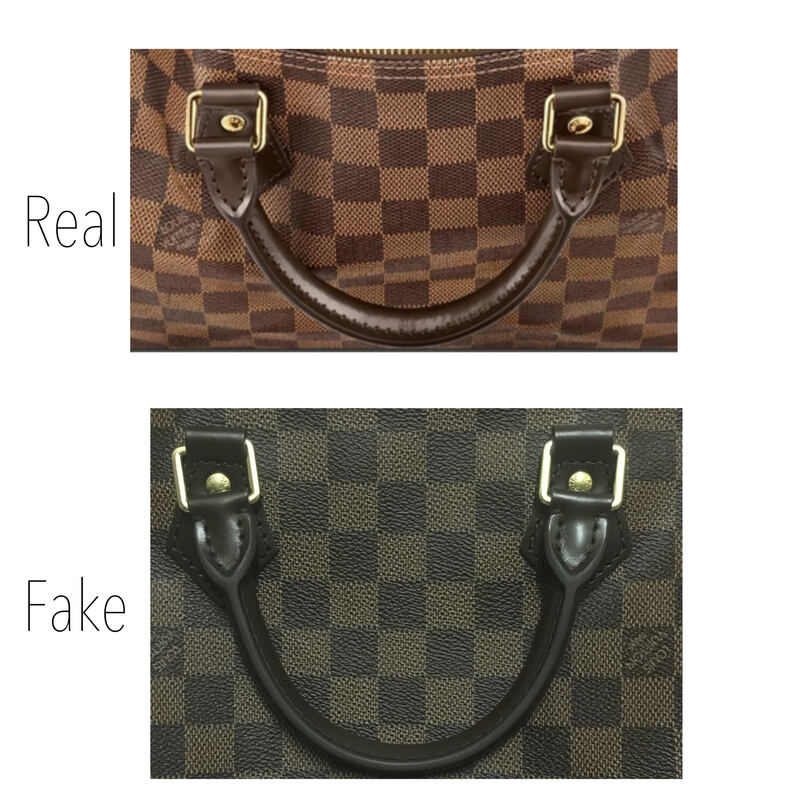 To be very precise about LV Speedy bag I’m listing the main differences between an authentic and a fake one. 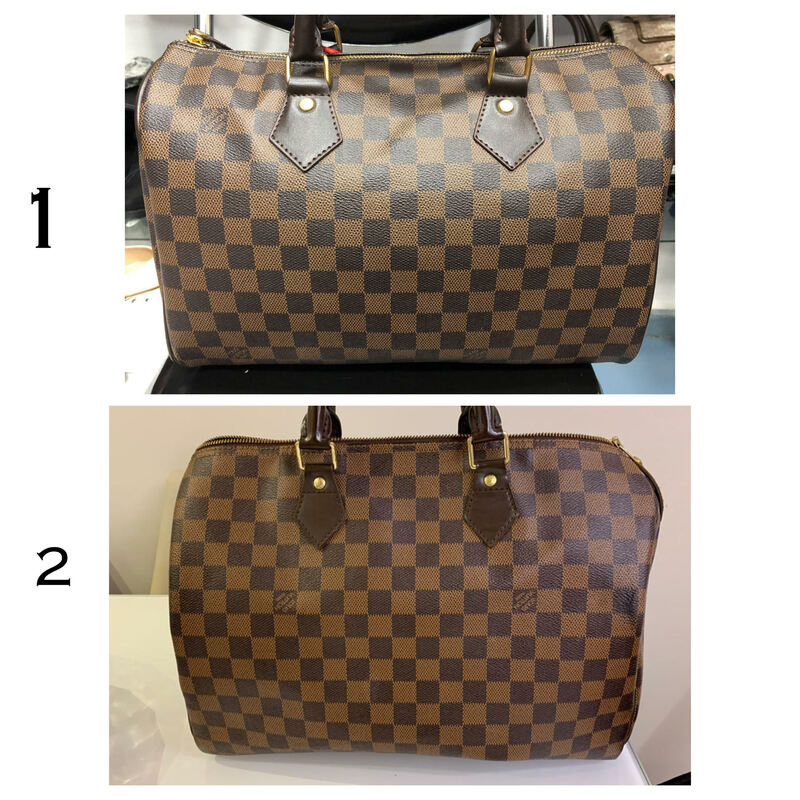 Let’s have a look at the details between two Louis Vuitton Damier Ebène canvas bags. In The authentic bag when you touch the leather it feels that the canvas is thicker and has a purple undertone. 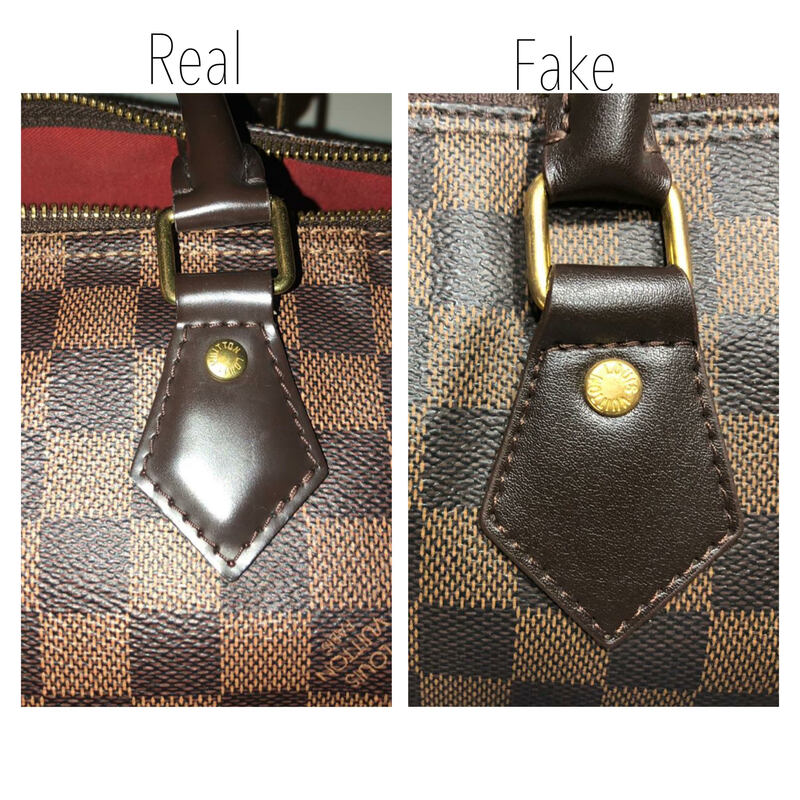 Whereas the fake Speedy feels thinner and has a more noticeable brown undertone. 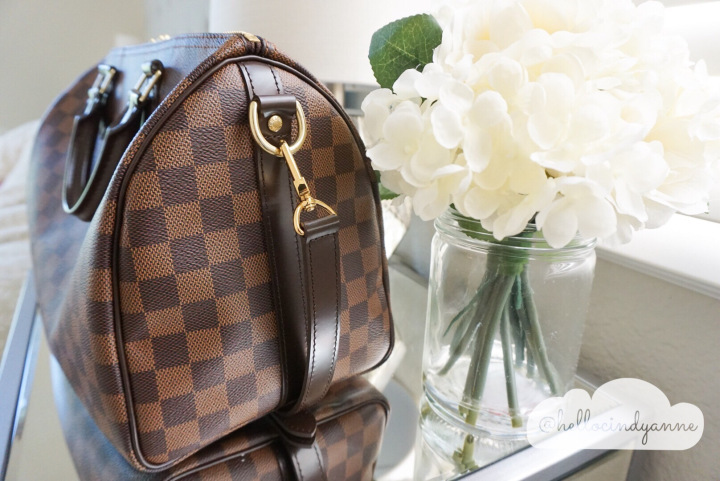 Little differences can be noticed in the writing Louis Vuitton Paris, inside the dark brown square of the canvas. 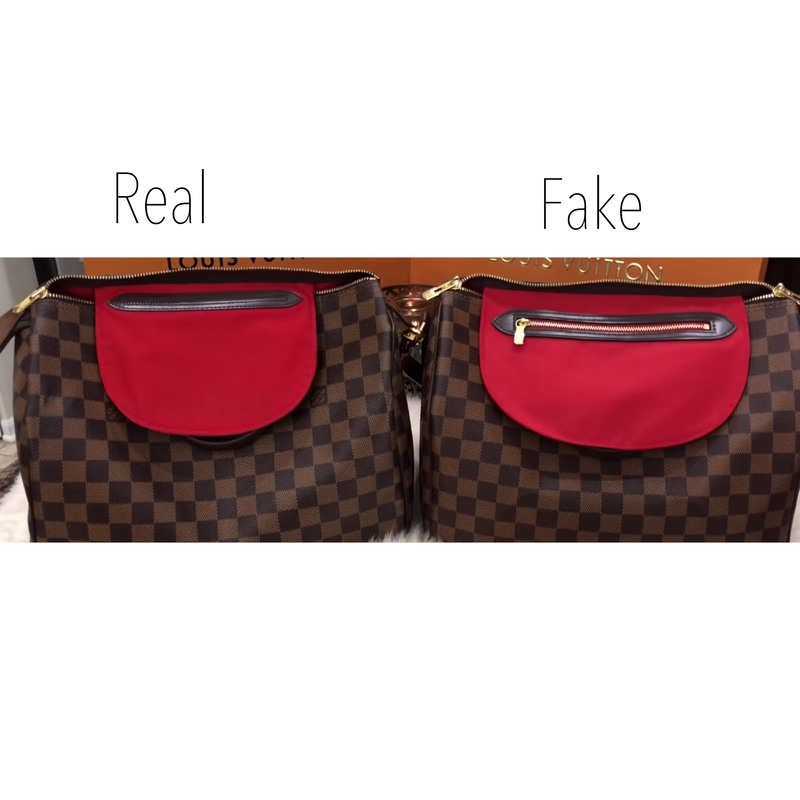 In the picture below, the first one is the fake and the second one is the authentic Speedy bag. Spot the differences carefully, looking at the colors and squares of the canvas. The handles can be distinguished by the way it feels, the finish and the thickness. 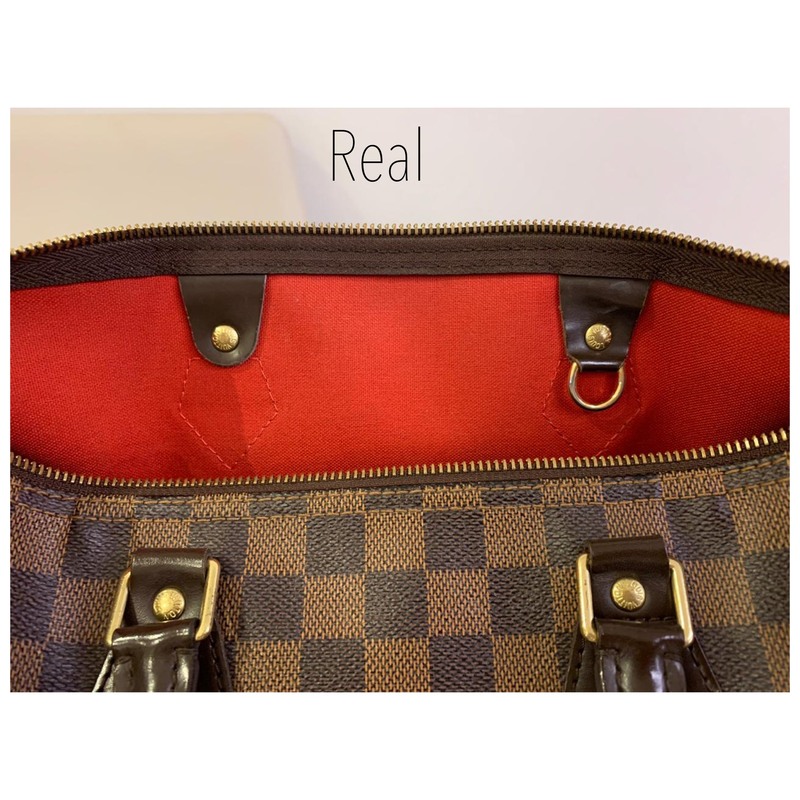 The authentic is a lot smoother, thicker and has a shiny finish, not matte. 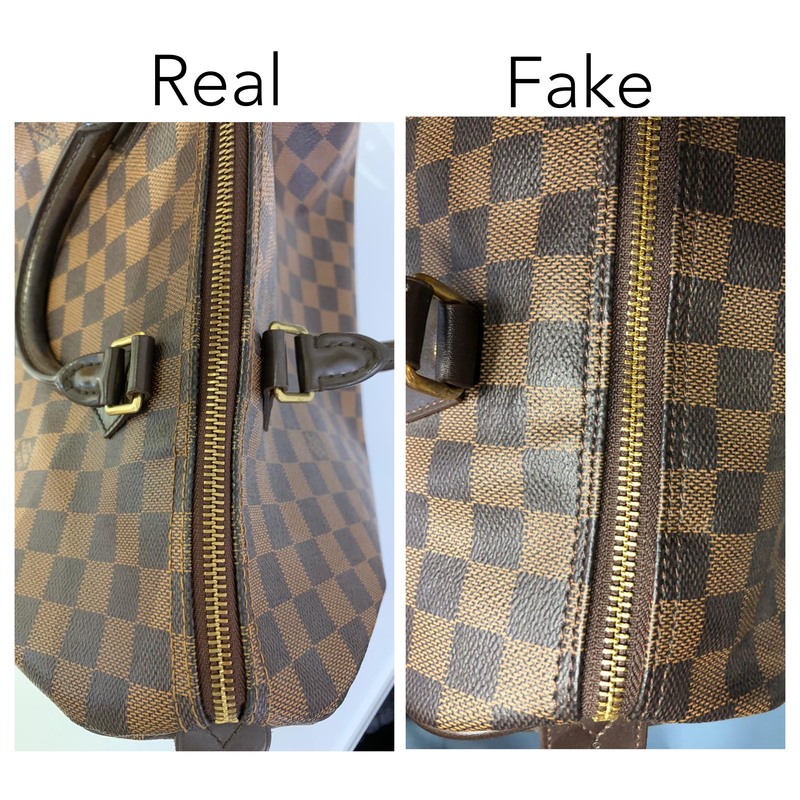 Whereas the fake one is thinner, has wrinkles and it is not as smooth as the original. There may be times where the authentic has wrinkles, but you will need to pay attention to all of our suggestions in order to understand which is the authentic one. 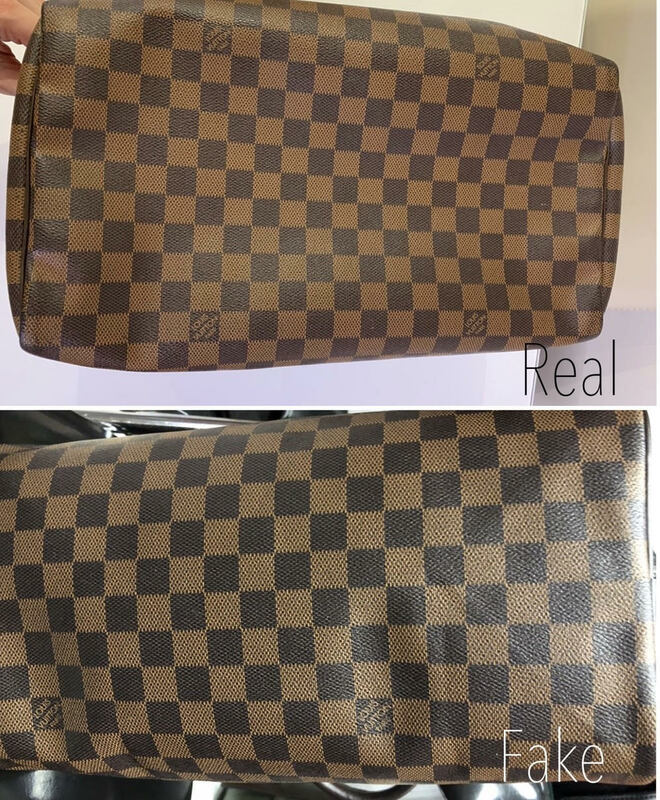 In the real Speedy bag the chaps have written on the gold pin Louis Vuitton, and in the older version of LV it has the flat chaps and the stitching goes below the gold pin. The new version of Speedy has puffy chaps and the pin is inside the stitchings. 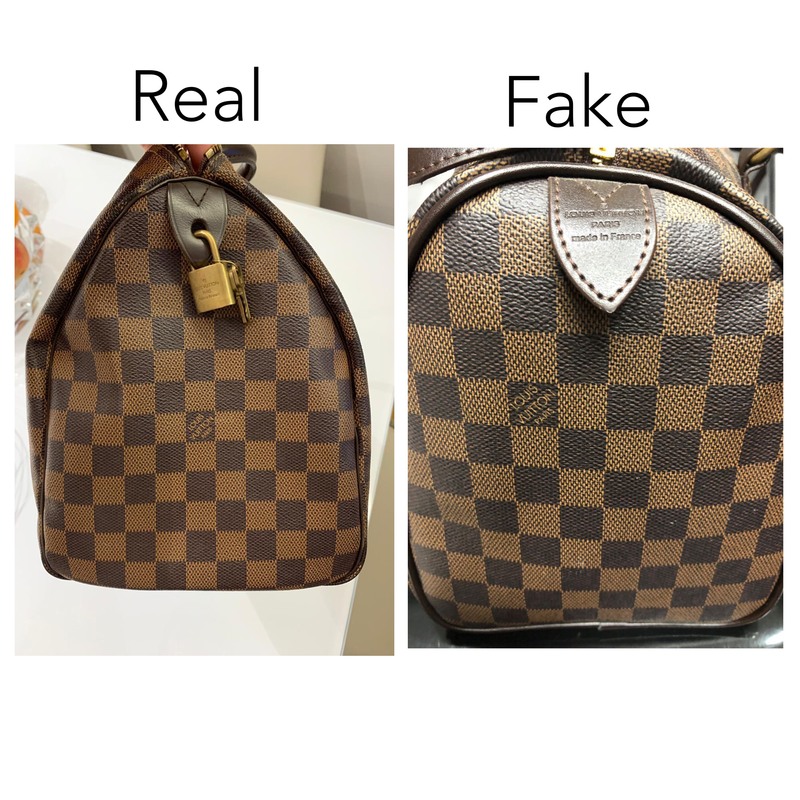 Here are the differences of the new version LV Speedy with the fake one. 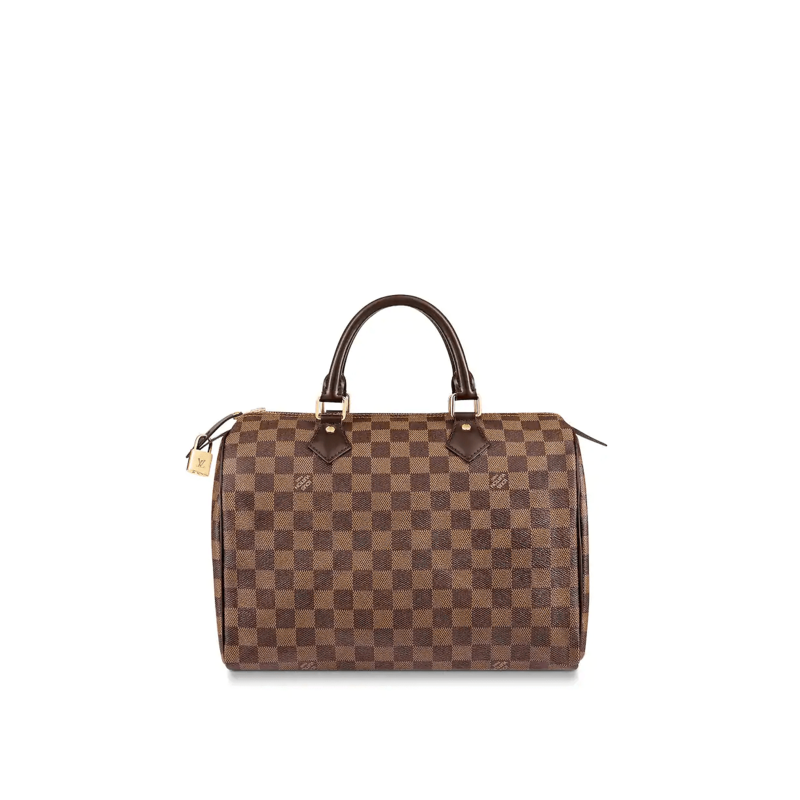 The Louis Vuitton Logo has always double T. Any bag that has it written differently it is a fake LV. 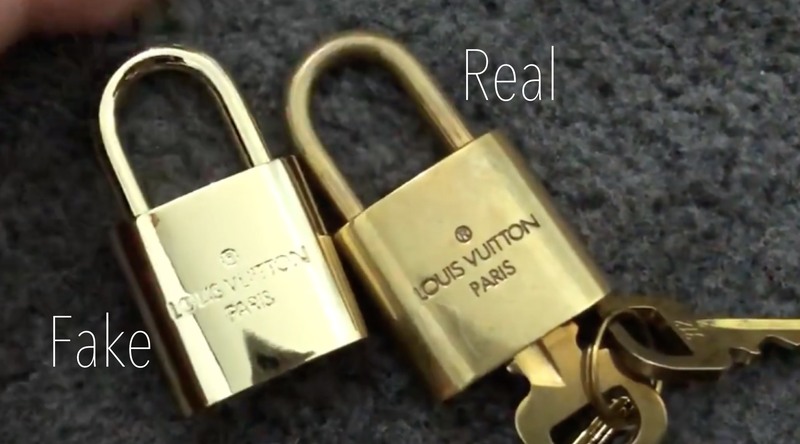 The authentic padlock has a more matte finish and not extreme mirror looking. 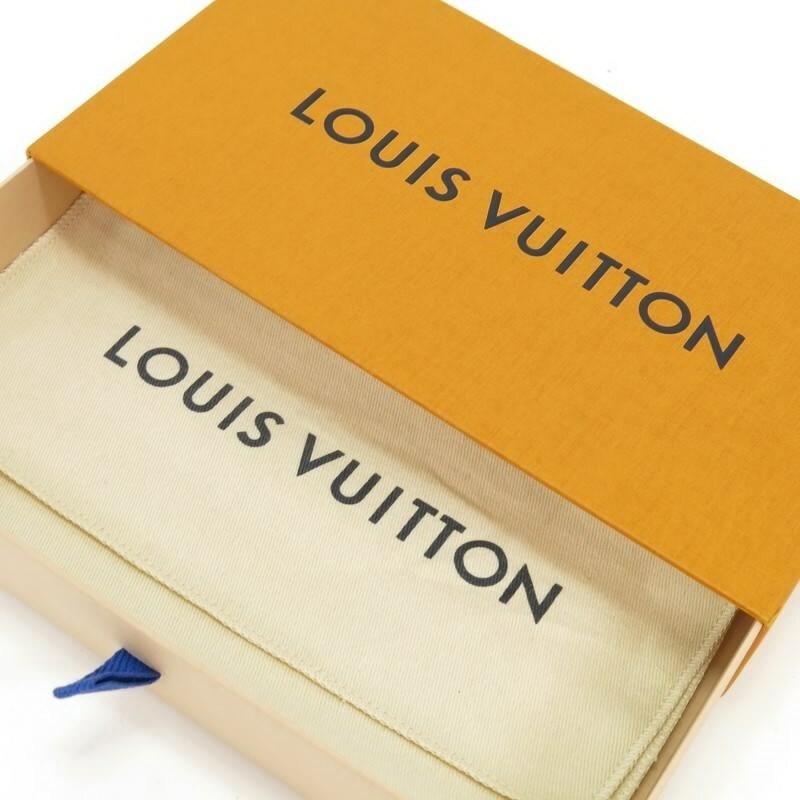 It has written Louis Vuitton Paris, whereas the O – letter is the shape of a circle and not oval. 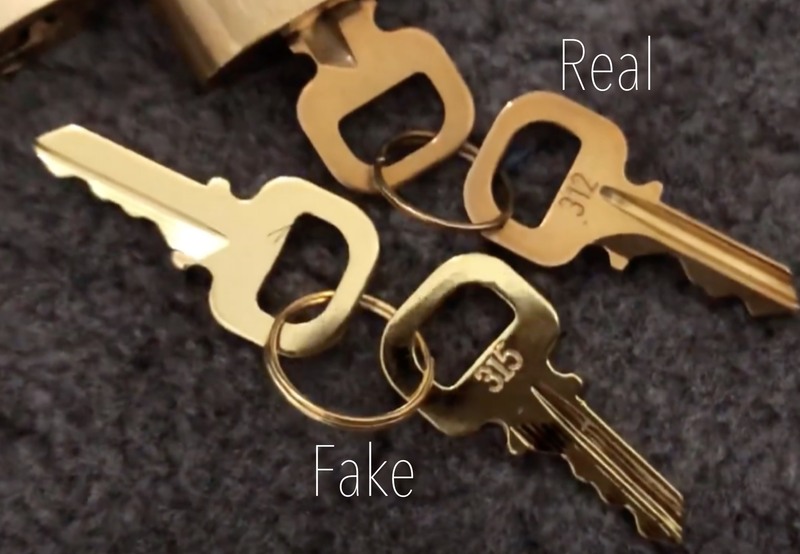 The keys have a serial number, where you can use it, you can replace in a Louis Vuitton Shop. On the other side of the padlock is written LV, where the end of the V never reaches the L.
The authentic stars with the dark brown squares and continues with the light brown squares. 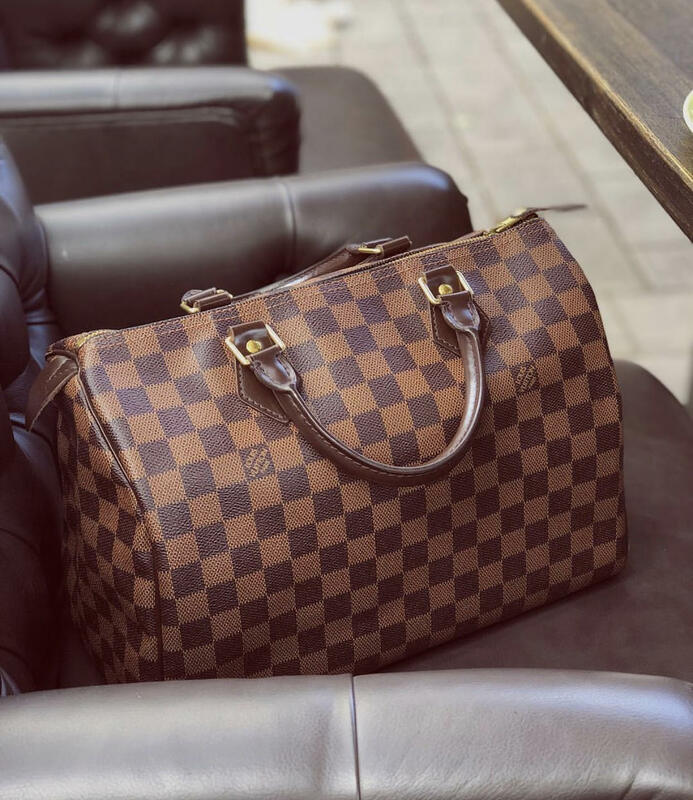 The leather on the side has regular stitches and writing Louis Vuitton Paris Made in France, which is very visible and clear. The Leather is the same color as the dark brown of the squares and has the same good quality. 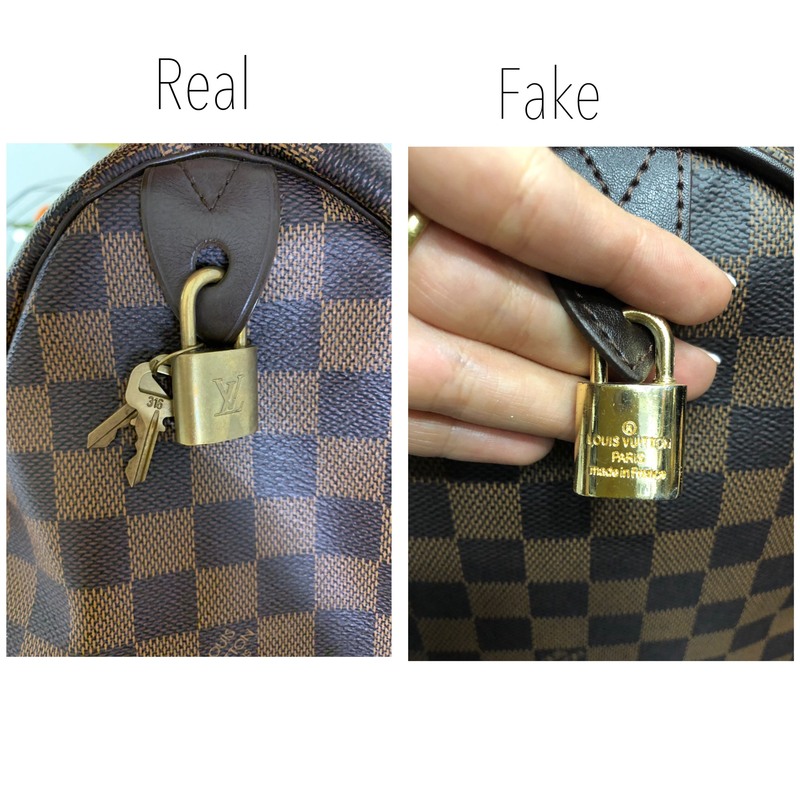 On the other side of the bag, you have a hole which you can place your padlock. The writing in the leather in the side is not written with stitches meanwhile in the fake is written with stitchings. For a better idea you have to look the differences in the pictures below. The zippers are matte, have regular stitches on the side, and the color of the stitches is the same as the color of the light brown of the canvas and the zipper glides right through. 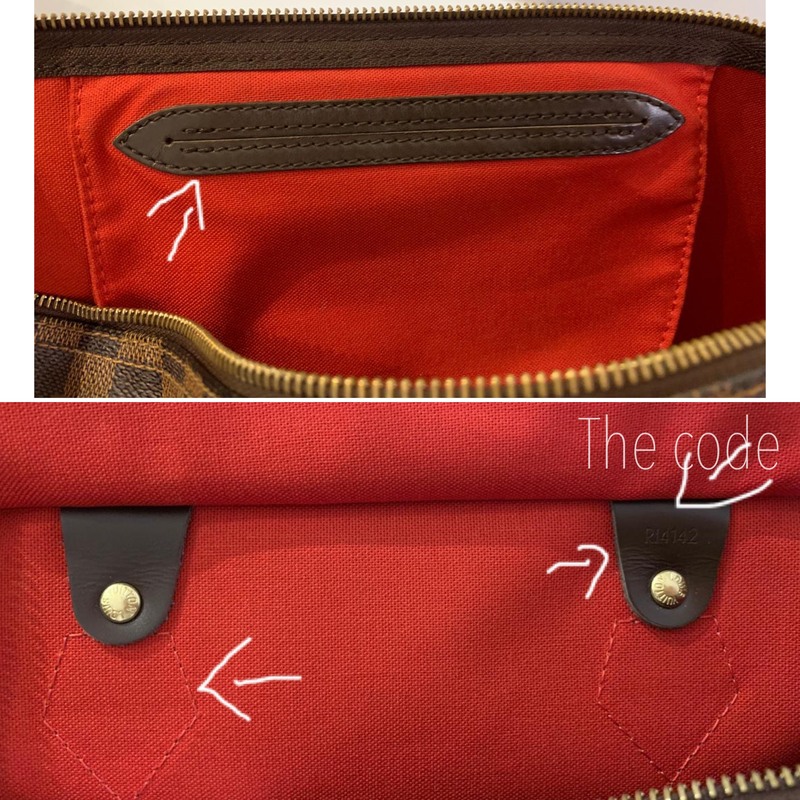 In one side of the interior, the pocket does not have a zipper in the authentic, the stitches are almost on a straight line. The color red is richer on the authentic. Under the pocket, you can notice two attachments with a gold pin which is placed on the same part as the outside attachments. In one of the attachments, you can also find the code of authenticity. Take a look at the other side of the interior, you will find two attachments with the same quality as the ones under the pocket. 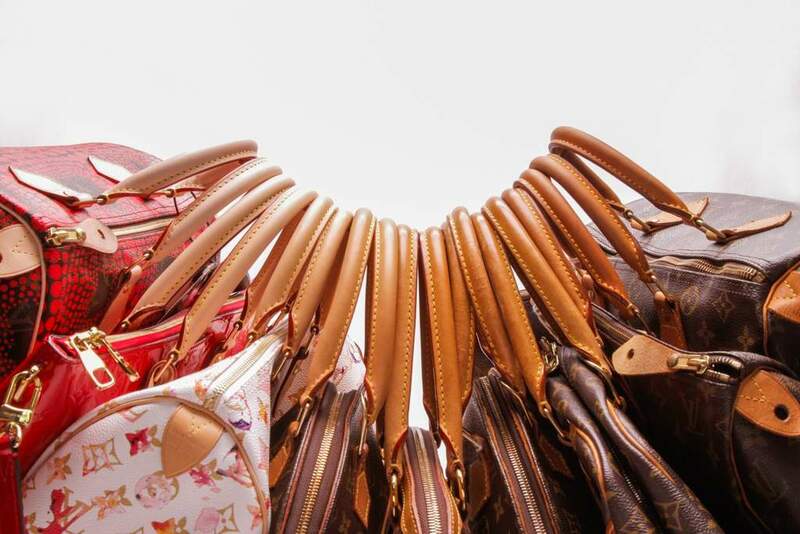 In order to be able to distinguish the bags, take a look at all the pictures and notice the differences between the bags. 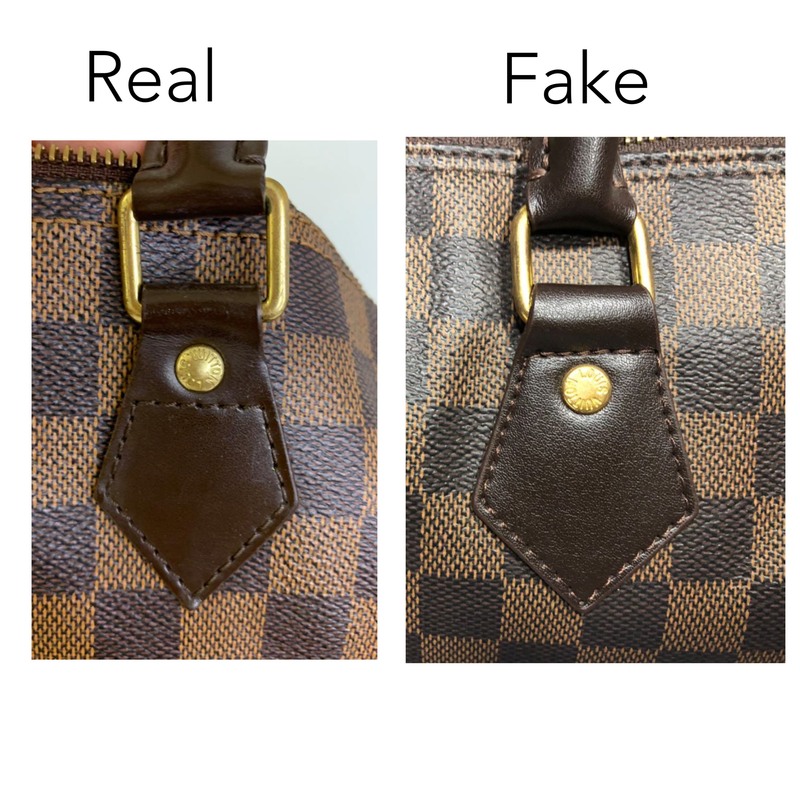 On a first glance look, you can easily identify the authentic from the fake just by the shape of the bag. The squares, attachments the written on the squares etc. The first one is the real and the second is the fake one. 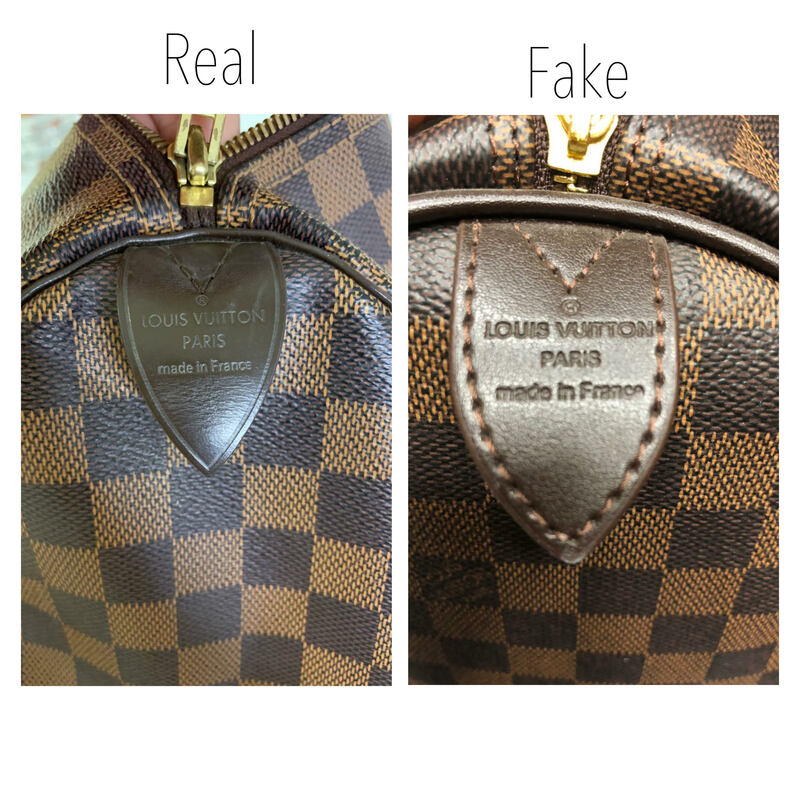 You can identify the authentic because in the bottom there are four symmetrical squares with the writing Louis Vuitton Paris, meanwhile in the fake one is not written in a symmetrical way.